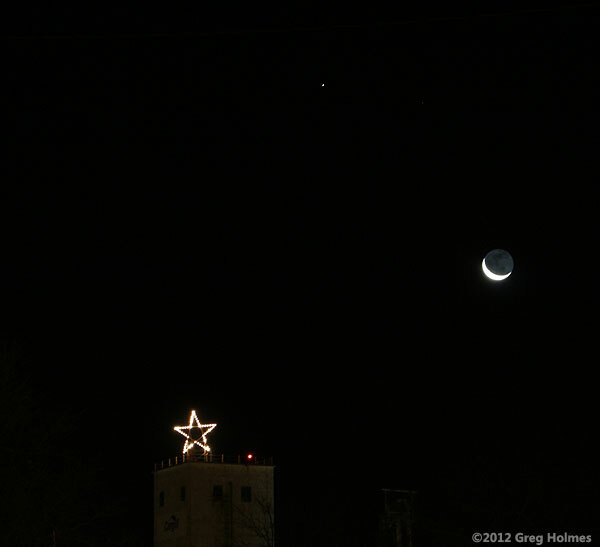 I finally got a shot I'd been wanting for a few years when a clear sky coincided with me being at home in Hutchinson, Kansas, during a waning crescent December moon. 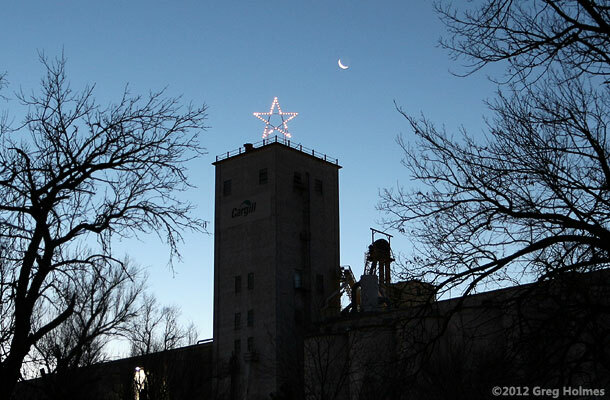 Here's the scene: a decades-old Christmas star atop what is now Cargill's grain elevator near 3rd and K-61 in Hutchinson. I cropped out the ground clutter. I'd actually been trying the shot since about an hour after the moon rose that morning. Contrast and limited dynamic range were a problem, but pre-twilight conditions still netted me the moon, a man-made star and a real one (or planet?). 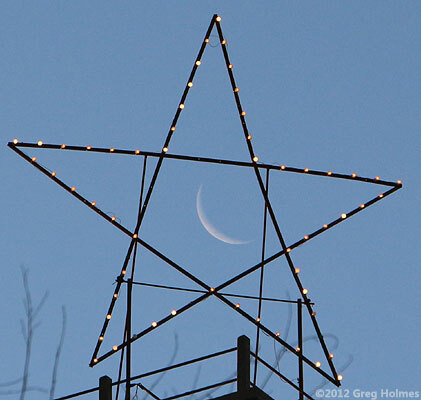 I was actually trying to get the moon inside the star, but my position for that alignment kept ending up being on someone's house, in their yard or in a tree. Bear in mind, this is the middle of the night (I started at 4:30) and I'm driving slowly down streets and alleys; it's a small wonder the police were never called. Plus, I was freezing. The pre-dawn blue sky enabled my favorite result. 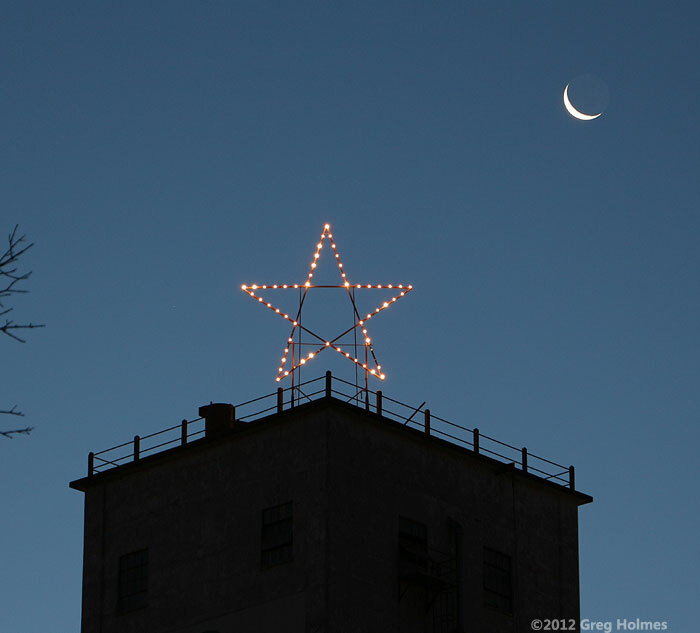 By the time I could actually get the moon inside the star after sunrise, I could see it wasn't what I wanted at all. 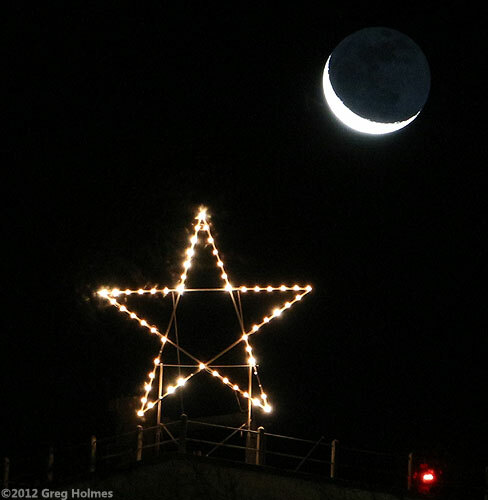 I'd love to know all about the history of this star, especially as I've already done a story on the star in Fredonia, so if anyone can inform me, please do. The one person who stopped and asked what I was doing said he was related to the builder of the star. I'll follow up on that in the new year. He also said that when a bulb blows, it sounds like a bomb going off.